Interior Design Services by Ankie Kitsz | Accessible interior design, creating authentic interiors to suit your budget. 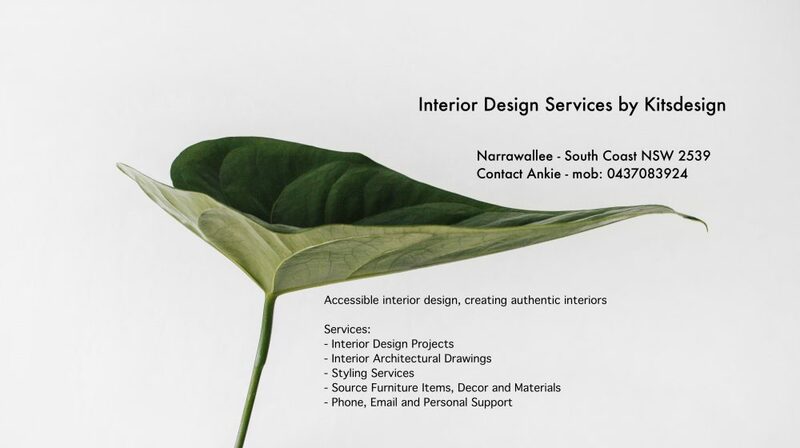 Services: Interior Design, Space Planning, Styling, Sample Boards, Source Products and Materials, Home and Site Meetings, Source Samples and Phone, Email and Personal support. The first consultation with new clients is free of charge. The aim is to establish a relationship with each other and discuss what the expectations are of the client. We will inspire you with ideas, designs and concepts to transform your home into a functional space to suit your current lifestyle, or, to revise the internal design of an existing building shell, or to revamp the current interiors. What is an Interior Designer: Interior architecture can be described as a combination of architecture and interior design. This includes the selection of interior materials and furnishings plus the design of the room/s. Interior architecture deals with everything on the inside of homes, buildings and other structures. As well as the functional arrangement of all rooms, placement of walls and the sequence, shape, proportion and scale of the spaces. A qualified Interior Designer focuses on choosing interior materials, finishes and furnishings. In every project there is a process of change and it is essential that everyone who is affected or involved are part of the discussions before a design starts. The presentation: This is the time you get to visualise how your home is going to look. You and the designer will go through every drawing, selection of materials, fittings and fixings and get the first glimpse of how much the job is going to cost. Inevitable, this is where compromised will be made. Unless you have an unlimited budget you look at the nuts and bolts of what can really be achieved as you space, time and budget are assessed. From here, things can go in a few different directions. You might be over the moon with the first presentation of you may change a couple of things, or you could rethink what direction you wanted to take with the design and then move and swap things around, watching it develop in front of your eyes. You may have to cut your losses now, but it will be less expensive then getting halfway through the renovation and realise you have made a big mistake. Program: Your designer can be involved, on your behalf, with the successful building construction company. The builder will develop a construction program that shows the sequence of the works from when construction commences until completion of the project. Changes to the construction period may occur because of weather conditions, un-availability of certain materials, delivery delays of products and materials.Before construction commences a contingency plan has to be developed, to deal with unforeseen expenses. A 10% contingency of the total building project cost is a standard amount in the building industry and will cover the cost of additional work, which may arise.